Gutti vankaya Kura is a very delicious recipe from Andhra. I make this dish regularly in my home. We have this dish with plain rice or chapathi. Here goes the recipe. Wash and pat dry the brinjals and keep aside. Take a mixie jar, add all the ingredients to grind. Ground them on the pulse to form a paste. Do not add water. Take the grounded powder into the bowl and add 1tsp of oil and mix well. Trim the brinjal stem and slit them in the middle without breaking them. Stuff the masala mixture into all the brinjals. Heat a pan with oil, add mustard, urad dal, and cumin seeds. Once they begin to crackle, add chopped onions along with curry leaves and fry till becomes translucent. Add chopped tomatoes along with the remaining masala powder and cook on high to medium flame for 5 mints until tomatoes are cooked. Pop the stuffed brinjals and fry for 5-10 mins on medium, be careful not to burn the masala. Add required water and cook till the brinjals are cooked. Finally, garnish with coriander leaves and enjoy taste Gutti Vankaya Kura. Gutti vankaya Kura is a very delicious recipe from Andhra. I make this dish regularly in my home. We have this dish with plain rice or chapathi. Take the grounded powder into bowl and add 1tsp of oil and mix well. Heat a pan with oil, add mustard, urad dal and cumin seeds, once they begin to crackle, add chopped onions along with curry leaves and fry till becomes translucent. I love stuffed eggplant and your curry is making me drool. Love that color! Stuffed eggplant is one of my favorites way to enjoy the mini eggplants. I love your version, it looks so tasty! 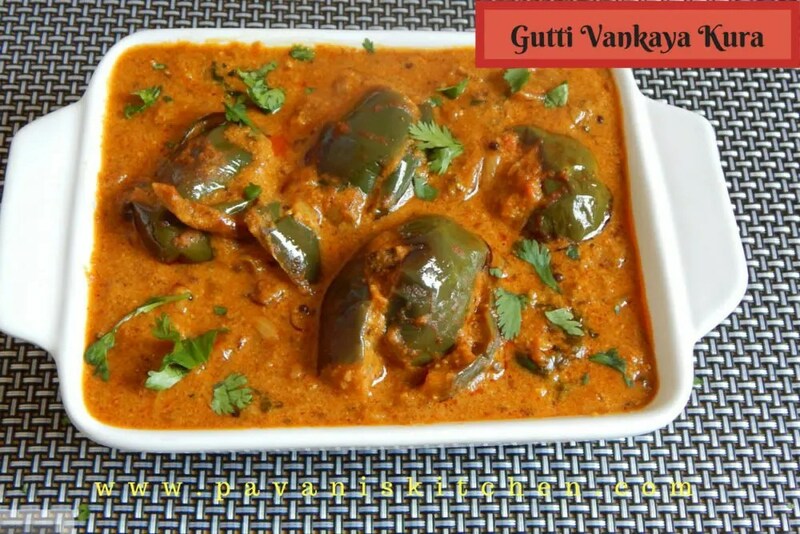 Gutti vankaya kura is one such dish, brinjal haters in my family as well love it specially with chapathi. Click is beautiful 😍😍 .I have never used poppy seeds in masala. I will add it next time. brinjal curry looking lip smacking with the gravy. drooling over my screen brinjal is my favourite veggie. 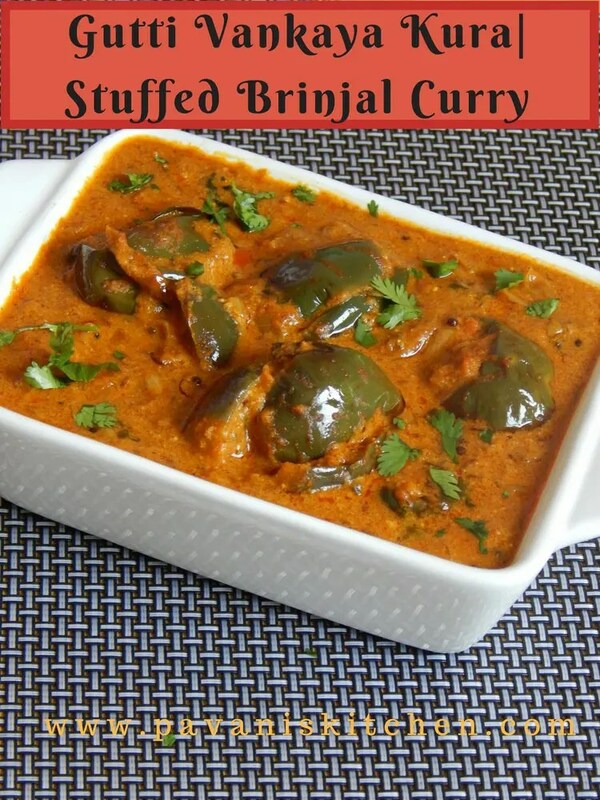 Stuffed Brinjal curry is my all time favourite and your curry looks simply irresistible ! Beautiful color and the gravy looks rich and spicy..yum ! I love stuffed brinjal but prepare it rarely. Now i am tempted to make it. Nice share. I just love stuffed brinjal curry. Each state has its own version. Loved this Andhra version and I’m literally drooling over the pictures. Will surely try this recipe. I love stuffed brinjal curry and yours look so tasty. Thanks for the awesome share. Such a rich and masaledar, can’t stop drooling at this rich gravy. I loved to eat with roti & side salad. Absolutely yummy share! !